Global Broth Market size was worth over USD 2 billion in 2016 and will witness CAGR over 4% up to 2024. Rapid shift in consumer food preferences along with increasing health concerns is driving broth market size. Health benefits such as improved immunity, hydration, muscle protein synthesis, weight loss and anti-aging properties are expected to influence product demand. Increasing consumption of ready to eat food owing to busy lifestyle and rising working women population will further propel the liquid stock market size. Increasing prevalence of leaky gut syndrome and arthritis among adults owing to poor diet will further support product demand. As per Arthritis Foundation, more than 50 million Americans were diagnosed with arthritis problem in 2016. By 2040, the U.S. population aged over 65, suffering from arthritis is projected to account for over 20% of the total population. Globally, increasing preference for healthy food to avoid long-term medical expenses is also anticipated to fuel liquid stock size over the forecast period. Surge in demand for additional healthy products among athletes and bodybuilders to boost performance, general fitness, and overall health will provide a strong business outlook for manufacturers. Key ingredients such as collagen, gelatin, glycine, and glutamine are expected to drive product consumption. Recovering of soft tissues, improved digestive health and immunity are the major factors supporting product penetration. On-going technological developments such as automation and digitalized industrial process for specialty food preparations will positively influence overall industry trend. Meat, poultry, and fish processing industries are expected to upgrade their manufacturing line to produce additive-free bone stock and sauces. Manufacturers are anticipated to invest in modern technologies and expand their existing production capacity to gain competitive advantage. Increasing popularity of the bone broth in U.S., UK, and Spain is expected to open new avenues in the industry. The business is on small scale but growing rapidly and is expected to offer great business opportunities and high-profit margin for manufacturers. Financial support from government to set up production facilities which are likely to serve retail, industrial and food-service market is driving industry growth. Commercial bone broth industry is still unorganized owing to the presence of home-based and a few independent & specialized small-and-medium-sized companies. These manufacturers operate in the local market and distribute their product line through retail, health food stores and online. Stringent regulatory compliances during meat processing expected to increase overall production costs, thus, impacting the market price trend. 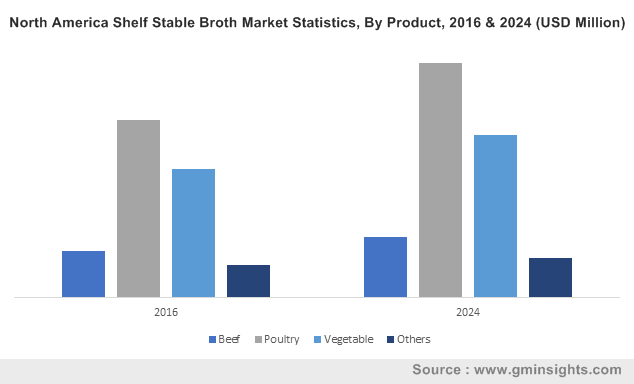 Shelf stable broth market size accounted for over 85% industry share in 2016. Changing dietary patterns and consumer preference for ready to eat food is expected to drive segment growth. 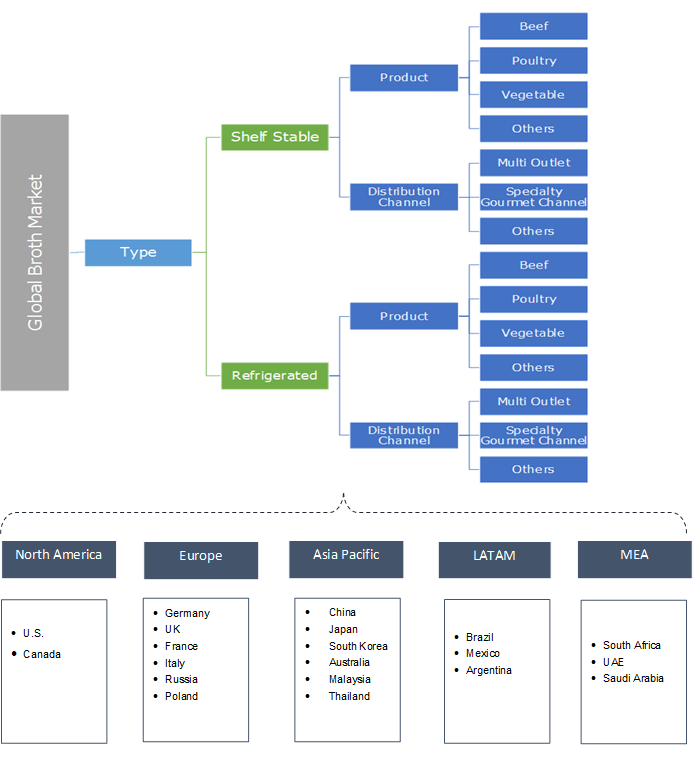 Increasing necessity to reduce the dependency on refrigeration services during storage, distribution, and marketing of consumable products influencing shelf stable liquid stock market size. Refrigeration technologies are comparatively costly for developing countries, thus manufacturers are expected to invest in cost-effective preservation to produce shelf-stable foods. Refrigerated liquid stock market size is expected to witness CAGR over 4% up to 2024. Shift in manufacturers preference for chilled and frozen meals to enhance product shelf life and avoid losses is expected to fuel segment growth. Continuous improvement in refrigeration techniques and rising demand for processed foods in developing countries expected to propel industry size over the forecast period. Beef broth market size is anticipated to exceed USD 450 million by 2024. Increasing beef production & consumption in Argentina, China, U.S., and Brazil will fuel segment growth. As per estimates, U.S. domestic beef per capita consumption was over 55 pounds in 2017. Continued improvement in beef import & export will also play a key role in influencing overall industry size over the forecast period. Poultry is estimated to hold over 35% of the market share in 2016. Growing animal protein consumption and increasing health consciousness in developing countries are key factors supporting segment growth. According to OECD/FAO estimates, global poultry meat consumption was estimated 111 million tonnes in 2015 and expected to surpass 133 million tonnes by 2024. Multi-outlet distribution channel is projected to witness CAGR over 4% up to 2024. Expansion of retail industry along with high consumer reliability has fuelled the product demand through this channel. Factors such as improved buying convenience and promotional strategies pertaining to discount and offers are driving product sales. In addition, increasing number of stores globally along with rising standard of living will provide lucrative opportunities for broth market size expansion. Specialty gourmet channel is estimated to hold over 10% of the industry share in 2016. Increasing popularity of healthy and gourmet foods among consumers driving growth in this segment. Shift in consumer preference for innovative products with superior taste profiles will also fuel product sales through the channel over the forecast period. Surge in number of restaurants offering specialty gourmet food will also boost enhance liquid stock market size. Europe market accounted for over 50% of the demand in 2016. Rising geriatric population and increasing health care services expenditures will support demand for the additional healthy food products. According to Eurostat, people aged 65 and above accounted for over 19% of the population in 2016. Key benefits such as improved metabolism, healing of joint pain and enhanced bone strength will drive product sales. Asia Pacific market size is anticipated to witness growth over 5% up to 2024. Increasing health consciousness among consumers and rising disposable income in emerging economies such as India, China and Malaysia will provide a strong business outlook for manufacturers. Rapid urbanization along with liberalization of FDI are major factors supporting regional liquid stock industry growth over the forecast period. Global Broth industry includes Campbell Soup Company, College Inn, Knorr, Pacific Foods of Oregon, Progresso, and Manischewitz. Other prominent players are Bare Bones, Paleo, Bonafide Provisions, and The Stock Merchant. The liquid stock market will provide a lucrative opportunity for new entrants. In addition, meat processing companies are anticipated to penetrate liquid stock industry to gain a competitive advantage over the projected timeframe. For instance, Belcampo a meat-processing plant in the U.S. has started to manufacture and distribute stock through its five butcher workshops and restaurants. The company receives bulk quantities of frozen stock from online shop thus, providing excellent service for consumer and food-service-industry.